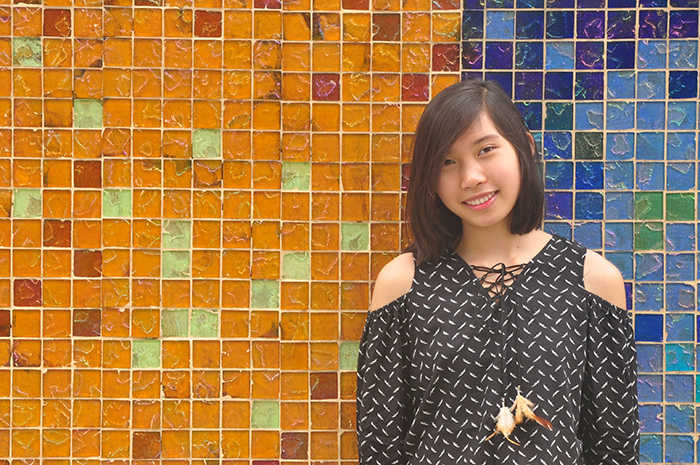 As an international student from Vietnam who minors in creative writing, Mina Nguyen ’19 must be able to express herself at a very high level, in a non-native language. She's so good at it that she tutors fellow students at Dickinson's Norman M. Eberly Multilingual Writing Center. But she doesn’t stop there. Mina works as a Chinese-language teaching assistant and as a student interpreter at The Trout Gallery, all while studying Japanese. She also sharpened her Korean-language skills as a study-abroad student in 2016. East Asian studies, with a creative writing minor. Alpha Lambda Delta, the Norman M. Eberly Multilingual Writing Center (tutor), Department of East Asian Studies (Chinese-language teaching assistant) and The Trout Gallery. Benjamin Rush Scholarship, Hugh B. & Helen K. Woodward Scholarship and Dean’s List. The Trout Gallery. It was a blast working as an interpretation assistant there. I had the most interesting conversations with the gallery attendants. Cream of rice with raspberries, blueberries and sunflower seeds. Cream of rice definitely has to be on the breakfast menu more often. Either teaching myself the entire hiragana alphabet for a Japanese quiz I didn’t know I would have the next day—all within two hours—or understanding higher-level Korean. [Assistant] Professor [of History] Evan Young. He gives a lot of readings (and I mean a lot), is a strict grader and expects a lot from his students, but he also taught me the most about academic reading and writing. I can always count on his courses whenever I really feel like challenging myself. I will be somewhere in this world, continuing with my writing and language acquisition; that’s how I communicate with myself and with the world. I don’t ever see myself parting ways with those two things. Definitely the day I met Yoko Tawada in my Contemporary Japanese Literature class. We were learning about translation theories, and I had written an entire paper about the relationship between two of those theories, one of which was formulated by Tawada and the other by Walter Benjamin, another theorist. That day, Tawada came to visit our class, and toward the end of our discussion, a classmate asked her about her thoughts on Benjamin’s theory. We were all waiting for her to give a profound answer, but we ended up laughing when she said that she doesn’t quite get his theory. I know it wasn’t entirely true (Tawada is very well-versed in translation theories), but it was nice to get a reminder that no one knows everything. Learning is important, friends, always! In summer 2016, I went on a summer study-abroad program in Seoul, South Korea. There were classes and assignments, but I wasn’t bombarded with things to do and events to attend. I could just hop on a bus whenever I felt like it and watch the city in motion, then hop off whenever I got bored of that. And every single time, there was something interesting nearby. There was this one time when I got off at a bus stop with a bench shaped like a really wide toilet seat. Drawing plants and imitating a minion, singing the "Banana Song."